Results from our national 2012 / 13 high point awards are now available for downloading. Congratulations to all the various winners. This annual event will be held at Talunga Park in Mt Pleasant. For more information visit Dilutes Australia SA Branch Championship Show 2013 on Facebook. Incorporating an Open Dilute Show open to all registered dilutes regardless of register as well as Dilutes Australia only ring. Congratulations to all the winners in both rings. Latest Opal Award TM Winner!!!! 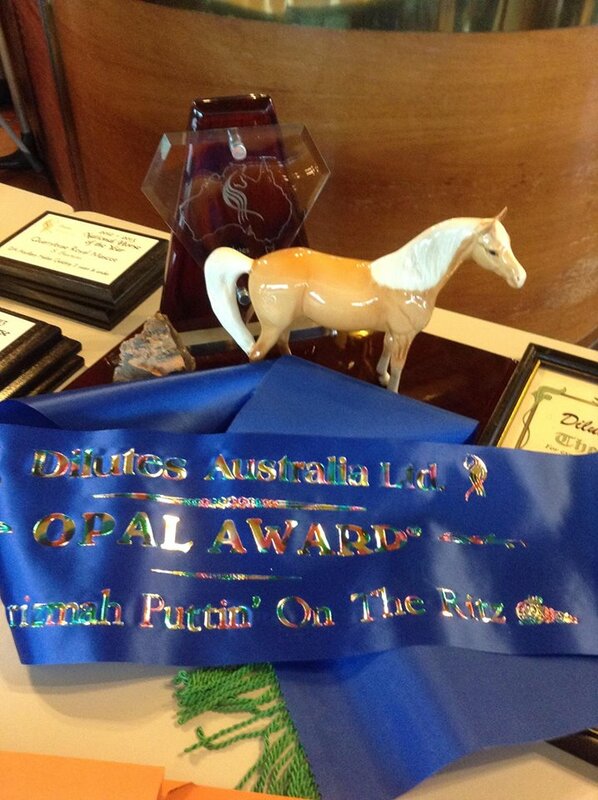 Congratulations to Sue-Ellen Brook and her beautiful palomino gelding Karizmah Puttin On The Ritz on receiving their Opal Award for excellence in all round performance. Congratulations also to his breeders, Jenny Stock and Paul Yagilnicky. To share in some of this lovely boy's successes, visit the Over To You page. Congratulations to all winners and placegetters. Held at Pontville. Held at the Tarampa Hotel and what an array of gorgeous trophies on display. For results and piccies visit the Qld Branch FB page. Congratulations to all the winners and placegetters at the Queensland Branch Championships.